Edmonton, Alberta (Canada) – One of Canada’s top fight promotions today released its fight card for its upcoming September 16th event, as Aggression MMA announced opponents for Ryan “The Real Deal” Ford, Tim “Thrashing Machine” Hague, and Freddy Assuncao. In addition, a featherweight title match between top Canadian 145-pounder Adam Lorenz and UFC veteran Alvin “The Kid” Robinson has been added to the night’s fights. “Unfinished Business” will be broadcasted live across the globe through online Pay-Per-View at www.AggressionMMA.com. 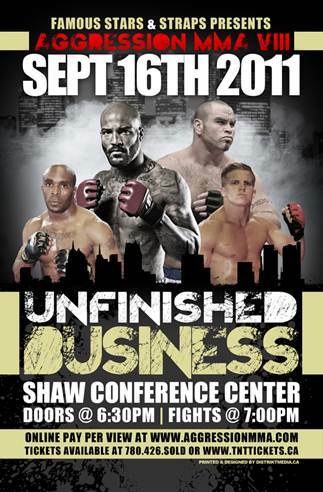 “Unfinished Business” will take place at the Shaw Conference Center on Friday, September 16th. Doors will open at 6:30 PM, with the first fight hitting the cage at 7 PM. Tickets are available over the phone at (780) 426-SOLD, or online at www.TNTTickets.ca. Tim “The Thrashing Machine” Hague, at only 27 years old, is a five-time UFC veteran who has proven his talent and mettle over and over again. A brutally strong competitor, he has finished his opponent in ten of his twelve victories. After three separate stints with the UFC, he returns to his native Canada to get back on the winning track. And he’s hungry to prove he belongs amongst the best heavyweights in the sport. On September 16th, Hague will face a heavyweight with a lot of fights under his belt in Vince Lucero. A native of Arizona, Lucero has over forty fights on his pro record, and has competed all over the world against notable fighters such as Jimmy Ambriz, Travis “Ironman” Fulton, UFC veterans Christian Wellisch, Soa Palelei, Roy Nelson, Brad Imes, and Eddie Sanchez, Strikeforce’s Lavar Johnson, former UFC heavyweight Champion Tim Sylvia, and Bellator monster Ron Sparks. A native of Recife, Pernambuco, Brazil, Freddy Assuncao made his pro debut in 2009. Fighting is in his blood, as evidenced by his brothers, Raphael and Junior, who are themselves accomplished MMA fighters. All three brothers train together outside Atlanta, Georgia at Ascension Mixed Martial Arts. Both Raphael and Junior currently fight for the UFC: Raphael is coming off a unanimous decision victory at UFC 134 in Brazil, while Junior is scheduled to re-enter the Octagon for the first time since 2007, as he competes at UFC 135 on September 24th. Freddy, the youngest brother, is coming off a submission victory over UFC/WEC vet Kit Cope, but has shown that he isn’t a one-trick pony, as evidenced by his evolving striking game. He is a prospect MMA fans need to keep an eye on, as the sky is the limit for this developing young star. At “Unfinished Business,” Assuncao will defend the family name against British Columbia’s Baz Cunningham, a solid Canadian prospect with a penchant for putting on electrifying performances in the cage. “Unfinished Business” will also host an Aggression featherweight title fight between Adam Lorenz and Alvin Robinson. Lorenz has started off his career by building a strong record, and is one of Canada’s top featherweight prospects. Meanwhile, Robinson is a four-time UFC vet looking to climb back to the top of the mountain. There are several other top Canadian combatants competing on the card as well, including Nick Penner, Tim Chimelli, Stephen Beaumont, and former CFL star Rio Wells. In addition, “Unfinished Business” will showcase two undefeated female fighters in Sy Jewitt and Sarah Moras, in what promises to be an entertaining scrap.